Purpose: Use this document to close a requisition for Purchasing in ctcLink. 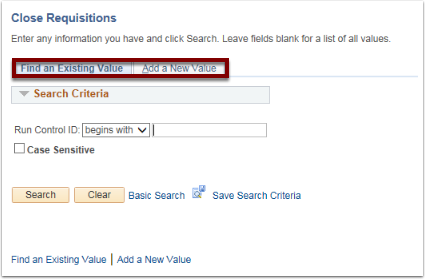 Use Find an Existing Value tab for an existing value OR Add a New Value to add a new value. Click Search if using Find an Existing Value. Click Add if using Add a New Value. 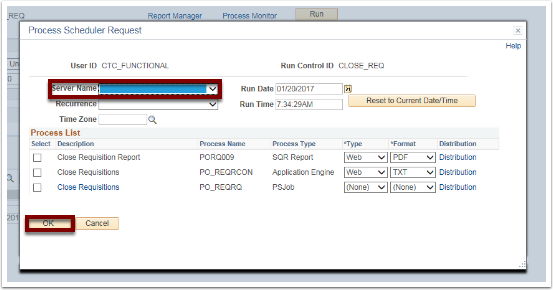 Use the Close Requisition page to run the Close a Requisitions process and produce the Requisition Reconciliation report. Enter information into the Business Unit field. Use the ChartField Criteria group section to select requisitions for processing based on ChartField values. This option is useful if you are using commitment control and want to process requisitions based on ChartField values. You must select a Server Name to identify the server on which the process will run. If you use the same Run Control ID for subsequent processes, the server name that you last used will default in this field. Use the Process List page to view the status of submitted process request.